A porcelain light sculpture that illuminates just by being in your presence. You've always been told you light up a room. This petite work of lighting art just affirms it. 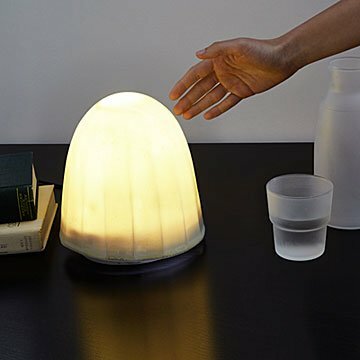 Made of translucent porcelain, it illuminates when it "senses" a human's electromagnetic field. How, you ask? Hover your hand near the base, and a sensor connected to a computer chip tells the LED light to turn on (or off). The glow is warm, and the design is sophisticated, making it just right for your desk, den, or bedside table. Made in Asheville, North Carolina.